Share the post "Department of Animal Sciences Bids Farewell to George Eager"
George Eager pictured with Laura Gladney (Animal Sciences). Photo credit: Kathy Manger. 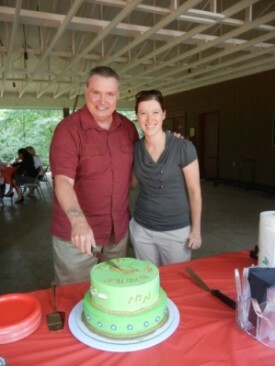 George Eager (business specialist, Animal Sciences) retired on July 6 and was feted at a Log Cabin barbeque attended by department faculty, staff, and students as well as colleagues from Martin Hall. Department Chair Carol Bagnell and former chairs Larry Katz and Dipak Sarkar thanked Eager for his efforts in turning the administrative affairs of Animal Sciences into an efficient and productive operation, contributing to the success of its research, teaching, and outreach programs. From managing payroll and personnel records to research grant administration and assistance to international scientists, as well as in supervision of Work Study students, Eager provided exemplary sustained service during his 11 years as a Rutgers University employee. On July 30, Damien Carroll-DeBose joined the Department of Animal Sciences as the new business specialist.